It's a beautiful day here in Minneapolis for day three of the Lincoln Stars 2013 tryout camp. Thankfully the sun came out a bit early this morning and warmed things up a bit. It was cloudy and cool the past couple of days so the sun was a welcome sight. The morning session started at 9:00am and ran until after 1:00pm. The games are progressively getting better and more fun to watch. I think the players are feeling much more comfortable out there, and are getting used to their teammates. A bit more hitting this morning than previously, which is good. 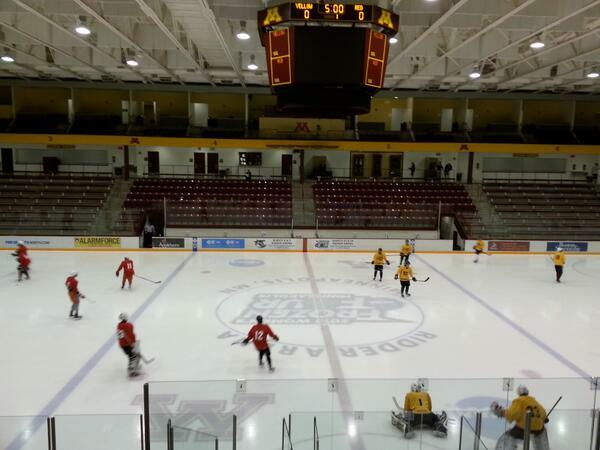 Team Red stayed undefeated with a 3-2 shootout win over Team Yellow in the first game this morning. Red is now 4-0, while Yellow dropped to 2-2. Scoring for Red in regulation was Jonathan Desbiens (penalty shot), and Gordie Helmuth (nice clapper top shelf). Scoring for Yellow in regulation was Thomas Carey (nice assist from Hunter Anderson), and Garrett Brossart (nice deflection off a Daniel Willett point shot). In the shootout, all three shooters for Red scored: Taylor Maruya (nice Pavel Datsyuk move), Angus Scott, and Max Humitz. Two of three shooters scored for White: Jake Larson, and Conner Thie. Red goaltender Michael Tilford started the first half of the game and gave up only one goal. Red netminder Jacob Nehama started the second half and also gave up one goal. Nehama stopped one of three shooters in the shootout. Yellow goaltender Jacob Dittmer started the first half of the scrimmage and gave up one goal. Yellow netminder Nick Schmit started the second half and also surrendered one goal. Schmit was 0-for-3 in the shootout. There were no fights in this scrimmage. Players from Team Red who impressed me were the goaltending duo of Tilford and Nehama, Zack Pittman, Gordie Helmuth, Angus Scott, and Taylor Maruya. Players from Team Yellow who stood out to me were Thomas Carey, Eric Brenk, Connor Chambers, Garrett Brossart, Jared Kolquist, and Nate Repensky. My MVP of Team Red goes to forward Gordie Helmuth who has a nice goal and seemed to be all over the ice. He's a gritty kid, and isn't afraid to get his nose dirty. My MVP of Yellow goes forward Eric Brenk who is a big kid, but has soft hands around the net and a heavy shot. Three players from Team Red were missing from the lineup this morning: Cal Walker, Brandon Parker, and Tommy Marchin. Derek Olmschenk and Thomas Stoxen were missing from the Yellow lineup. Team Columbia earned a 6-2 victory over the winless Team Royal squad to improve to 2-2. Royal fell to 0-4 after the loss. Scoring for Columbia was Kyle Fargesen, Brenden Dunning (two goals), Paul Heger, and Daniel Kucerovy. Scoring for Royal was Kevin Fitzgerald (nice top shelf snipe), and Nicholas Monfils. Columbia goaltender Brandon Wildung started the first half of the game and gave up only one goal. Columbia netminder Joshua Stone started the second half and also gave up one goal. Royal goaltender Joey Staely started the first half of the game and gave up three goals. Royal netminder Ashton Good started the second half and also gave up three goals. There were no fights in this scrimmage. Players from Team Columbia who stood out in my opinion were Kyle Fargesen, Patrick Condon, Todd Koritzinsky, Daniel Kucerovy, Brenden Dunning, and Zach Zech. Players from Team Royal who impressed me were Miles Manson, Lucas Little, William Scherer, Nicholas Monfils, and Kevin Fitzgerals. My MVP for Team Columbia goes to forward Brenden Dunning who had his best game of the camp so far with two goals, and was very close to getting one or two more Very nice individual effort on his first goal. My MVP for Team Royal goes to forward Nicholas Monfils who had one goal and has been Royal's most consistent forward in this camp. Team Black continued their hot streak with a 8-2 blowout win over Team White in the last game of the morning session. Scoring for Black was Magnus Hoff (two goals), Casey Linkenheld (two goals), John Simonson (two goals), Luke Voltin (goal of the camp so far; faked out two defenders before firing a laser top glove side), and Ludvig Hoff. Scoring for White was Blake Brazil and Luke Miller. Black improved to 3-1, while White fell to 1-3. Team Black has scored 20 goals in their last three games. Black goaltender Dylan Parker started the first half of the game and gave up only one goal. Columbia goaltender Brandon Wildung started the second half of the game for Team Black and also gave up one goal. White goaltender Michael Bitzer started the first half of the scrimmage and gave up three goals. White netminder Sean Healy started the second half and gave up five goals. There was one fight in this game which saw White defenseman Zach Frye drop the mitts with Black forward Brandon Smith. I called it a draw. Players from Team Black who stood out in my opinion were Jared Bethune, Ken Citron, Luke Shiplo, Brandon Smith, the Hoff brothers from Norway, John Simonson, and Luke Voltin. Honestly, the entire Black team looked great in this game. Players from Team White who impressed me were August Von Ungern-Sternberg, Blake Brazil, David Min, Zach Frye, and Kyle Williams. My MVP of Team White goes to forward Blake Brazil who scored a goal and had a number of other offensive chances. Stars forward Zach Aston-Reese and defenseman Beau Browning were missing from the Team White lineup in this game. That's it for the morning session. The evening session starts at 5:00pm and runs until 8:45pm. The first game this evening will be a good one....pitting the undefeated (4-0) Team Red against the offensive juggernaut Team Black (3-1). The top two teams of the camp will battle it out. Can't wait for that one.